It's been so warm here in Colorado Springs these past few weeks. Warm enough for all of my kiddos to have mild sunburns and browning faces. Warm enough that leaves have started to emerge from tree branches in our yard. Including blossoms... on our peach tree. I've apologized to our peach tree over and over. She sits right outside our kitchen window, and the story is she will produce a TON of fruit in years when all of her blossoms actually make it to the summer. So much fruit, in fact, that the weight of it will pull down her branches and they will break if not constantly tended to. So, I've been apologizing, because this warm weather has been in March. If you've ever lived in Colorado Springs or know someone who has, you know that snow comes in April and May... which is why our beautiful peach tree's blossoms rarely make it to the summer, to where they can bear fruit. Today I sit here watching storm clouds roll over Pike's Peak and down those majestic Rocky Mountains. There's sleet and snow in the forecast, along with lows in the 20's. We've come up with a little plan for our peach tree that involves an extension cord, my little heater dish and potentially a tarp. We probably won't be able to save all of the blossoms, but maybe we can help her get through with enough to bear some fruit this summer. And because this is only the beginning of April, we'll face these fruit-stealing storms for the next two months. "...so much fruit that the branches will break." I'm seeing the storm come in. 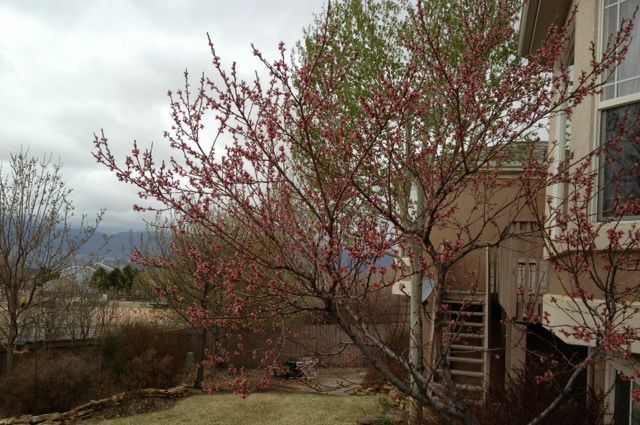 And despite our best efforts, our pretty peach tree will lose some blossoms. Except that... she will probably be better for it. If she bore all the fruit she was capable of bearing, she would lose branches in the process. Or maybe we could say if she bore all the fruit she was capable of bearing, she would need an extensive support system and our family being constant in our harvesting of the fruit so she wouldn't lose any branches. We can't be that this summer. So, maybe the storm isn't altogether a horrible thing. We'll work to get her through it, it will take some of her blossoms, and she will bear fruit without her branches breaking. I was chatting with a wonderfully lovely friend just recently. I was out in Michigan, speaking at a women's retreat for the second year in a row. I love that because I come back and already have relationship with many of the girls! My friend and I were chatting about life and callings and... there was a spark in her eyes at what we were talking about. But it was also with a frustration that storms had been passing through her life lately, and she hadn't been able to bear the fruit she knows she is capable of bearing. It's frustrating to feel limited, to feel those dreams burning inside you and think, "Oh, the fruit I could bear, if only..." To feel hindered by the storms... the changes in seasons... that keep passing through. But I wonder if, like my beautiful peach tree, my beautiful Michigan friend is actually better off for the storm. Because in the storm we have friends that come around us, helping us reach the other side with some of our blossoms. Yes, the storm still takes some of them, but I know I serve a God who wants me to bear the most fruit I can... in the healthiest way possible. If my peach tree bore all the fruit she was capable of bearing this season, she would lose some of her branches, because she won't have the necessary support system. I wonder if God knows my amazing Michigan friend has people around her to get her through the storm, but not the necessary support system to bear all that fruit without losing some of her branches. In fact, I know He does. So many times I've lamented "lost fruit," only to stop and realize I didn't have the capacity at that time to stay standing under the weight of all I thought I could have done. And we prepare for the storms, because we know they will come. We can rejoice for the fruit that is saved because we walk through the storm together. And maybe... just maybe... we can trust that "fruit lost" may have been for our benefit... so our branches will continue to grow stronger, and we can keep on bearing fruit. which may derail any spiritual mental conversations you were just having.